Noctopie clutched at the rocks as she looked into the tunnel where her sister had vanished. She didn't notice her father until he moved to grab her. At first the girl resisted grabbing at the rocks so hard that when he did remove her form the crack in the wall she took a piece of the wall with her. However when she realized that he was going to try to help Lalani the child quieted her sobs and shivered on the ground of the den watching frightfully. Her father changed then, looking like a monster out of an old black and white movie. However she knew that it was him, and she knew that he was trying to help. Noctissa only cried silently letting her tears wash her face as she watched and waited to see if their daddy could get to her sister. Lalani silently shivered in the darkness, not liking that small little lights were appearing above and below her. The sounds of her father above her made her a little calmer, but her side ached from how she fell, and the creepy crawlies of the deep seemed to get closer. She yelped as the shiny moved again... but it was so pretty!! Draken soon finished making the hole big enough for him to fit and he jumped down to where Lalani was. He looked around and saw Lalani surrounding by shiny glints. He tilted his head, confused. What were they? Why were they around her? Were some of the questions going on in his head, he practically froze, zoned out as he stared at the shiny glints around his daughter. Soon, he realized that he couldn't just sit there and watch his daughter be scared. 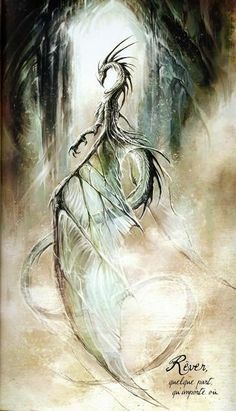 He dashed over breathed a dark mist around the area, grabbed Lalani, dashed away from the shiny glints, turned back to normal and held her close. "Sweetie... Are you ok? I was so worried." he said, as he nuzzled his daughter. Noct was still in the main den now above both her father and her sister. She had sat staring wide eyed at the wall as Draken had torn the rock a part in his feral monstrous form. Then he'd gotten deep enough to slip into the crevice of the earth and drop out of sight form the child. She didn't dare move form her spot, but out of concern for her family Noctissa called out loudly. DADDYY!! LAAANNIIII!!! She called loud and clear before quieting once more to listen and sob quietly. She didn't move, nor did she call out again as shadows quietly gathered around Noctissa. Her powers were turning on and gathering around her without her meaning to. Heck, she as a young dragon barely knew anything about her powers, and to see them forming around her trying to protect her was a surprise. Noctissa held herself as the shadows condensed into a cloak around her concealing the girl from her surroundings. She was afraid at first of the shadows forming around her, but then began to realize that they weren't hurting her. Eventually she poked them, and found that this did nothing but hide her paw from site in the ever moving shadows of her powers. Then she recoiled and sank back into a heap onto the ground. Lonely and scared Noctissa sat there quietly. Lalani shivered violently as she pressed herself into her fathers' grasp, whining as the shinies moved again. They vanished from over her, back into the darkness as she shook her head. "I don't like... darkness.." She whined, hugging her dad tightly. She felt horribly vulnerable, her wing ached, her heart felt like it was going to tear through her chest. But upon hearing small and loud cries from above her, from her older sister, she chirped incredibly loudly to try and get her attention. "Tissa!!" Lalani said, calling out into the darkness. She looked up at the small light above her, which was made larger by the scratches of her father. However, it was a long way up, and her wing throbbed incredibly painfully. "Is my wing okay?" She asked her dad, her blood seeming to freeze as the pain steadily grew worse. Draken smiled slightly when he heard his daughter speak, telling him that she was ok. He was scared still, he started checking Lalani, making sure that she was alright, to him, everything was fine. He heard Tissa call from above, telling him that she was worried as well, he didn't want that, so it was time to leave this area. "Lalani, you look fine to me, but you might want to rest ok, this is a lot for a little baby like you to handle... Come on." he was still holding her tightly and he climbed back up to where Noctissa was. he set Lalani down once they were back in the right place and nuzzled her a bit. "Look, I know this was a bit of a disaster, but tomorrow, we'll play, I promise, ok?" he asked, then laid down next to her, to keep her company. Noctissa still had a swarm of pulsating shadow surrounding her body but leaving a hole for her head to look through as she huddled there on the earth shivering. An answer back from Lalani though brought Noctopie back up to her feet as she pushed through her swirling shadows. They dissipated as she left them to look closer at the crack in the wall that her father had greatly widened. Then she spotted Drakens head as he appeared in the crack once more. Carrying her sister, Draken crawled up and through the hole in the wall before getting onto safer ground by Noctissa. Noct ran towards him and Lalani with tears in her eyes but refused to cry out loud as she did so. Then she tried to curl up by Lalani if her sister and father would let her.